This panel allows the admin to add new drivers to the system and manage them. Column visibility (eye symbol) – customize your panel, with this option you can switch on/off columns to create the most suitable setting for your company’s style of work. With a single click a column can be added or taken out of view. The user decides which ones he wants or needs to activate at a given time. Active column are highlighted with blue and the inactive ones are grey. Reset – (right-left arrow symbol) resets the column order to their default positions and setting. Refresh – if you wish to refresh the system, you can do that at any moment with the third symbol. In the General tab, the admin can generate access info for the driver (login and password). In the Personal and Other tabs, the admin can add the drivers’ details. 1. Create a new driver or start editing an existing one. 2. Go to the Other tab. 3. 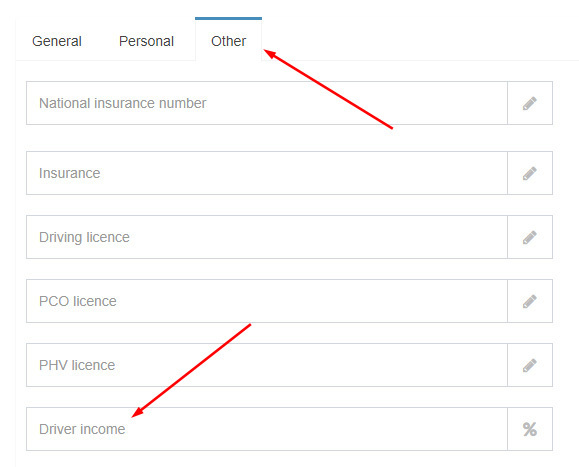 The Driver Income field is where you set a percentage that a driver will receive. Use 1-100 where 20 means 20%. 4. To save these settings, while creating a new driver click Create or Update if you are editing an existing profile. 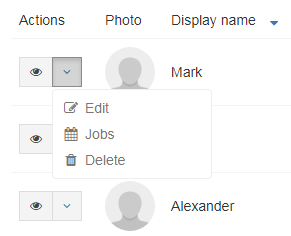 Use this panel next to each drivers’ profile to manage their accounts. View (eye symbol) – get a quick look at all the driver details. Jobs – a list of all the jobs assigned to a driver. Delete – think twice before using this one, it deletes the driver from the system and it cannot be recovered once deleted! All drivers’ details are divided into groups which you see in the panel as columns. We know the panel is your working space, a sacred space. Make it your own! That is why you can adapt and alter the columns order in any way you see fit.